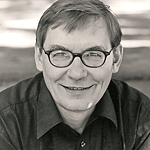 Kalevi Aho, one of Finland’s foremost contemporary composers, was born in Forssa in southern Finland on 9th March 1949. He commenced violin studies in his home town at the age of ten, and his first compositions also date from this time. From the autumn of 1968 he studied the violin and composition at the Sibelius Academy in Helsinki; his composition teacher was Einojuhani Rautavaara. After graduating as a composer (1971), Kalevi Aho continued his studies in Berlin (1971–72) as a pupil of Boris Blacher at the Staatliche Hochschule für Musik and darstellende Kunst. From 1974 until 1988 he was a lecturer in musicology at Helsinki University, and from 1988 until 1993 he was a professor of composition at the Sibelius Academy. Since the autumn of 1993 he has worked in Helsinki as a freelance composer. The central focus of Aho’s work consists of large-scale orchestral, chamber and vocal works; to date his output includes five operas (1978–2013), sixteen symphonies (1969–2014), twenty-eight concertos (1981–2016), three chamber symphonies for string orchestra, other orchestral and vocal music and a large amount of music for chamber ensembles and solo instruments. He has also made a number of arrangements and orchestrations of works by other composers. The most important of these is the completion of Uuno Klami’s unfinished ballet Pyörteitä (Whirls). In 1992 the Lahti Symphony Orchestra appointed Kalevi Aho composer in residence, and since 2012 he has been its composer laureate. In Finland Aho has also gained a reputation as an assiduous writer on music and with his writings and speeches he has also taken a critical stand on the culture politics of Finland. He has occupied a number of important positions in Finnish cultural life.